When the very disciplined Dayle Doroshow admits that she’s veered off her creative course to dabble in a few new polymer ideas that weren’t on her list, I sigh with relief. 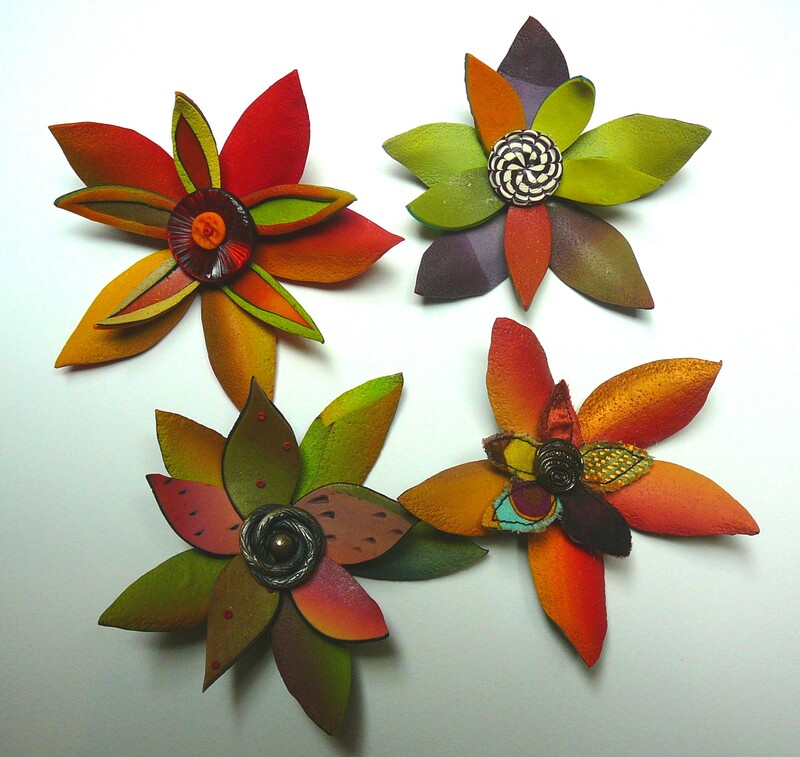 These Les Fleurs brooches aren’t the earrings she was supposed to be working on and they don’t directly relate to her project but aren’t they lovely? Dayle allowed herself some guilt-free time to play with glowing colors and sift through her stash of vintage buttons from French flea markets. 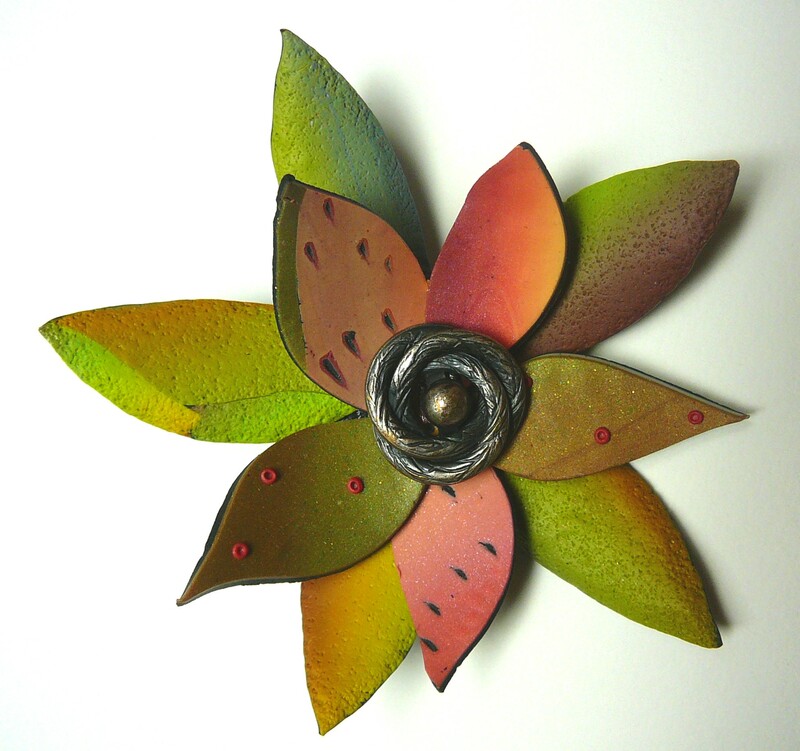 The petals are polymer with a few fabrics tossed in. The center of each flower is highlighted with a button. Seeing how fruitful and fun Dayle’s play time has been might take some pressure off your to-do list and give you a nudge back into the studio. Need more creative nudges? Check out our Creative Sparks book. Delightful and refreshing. Love the design and colors and use of the buttons. Cynthia, you caught me by surprise early this AM on the CA coast- I about fell off my chair. Thank you so much for showing my latest work and thanks Dawna and Melinda for your lovely comments. Today I meet with my “challenge” friend- I do have three earrings made and the other piece too- (will update my blog with that soon). Art Challenges are a good thing and also ignoring them to make passionate work “in the moment ” too! This post made me smile and smile. The creative process is endlessly fascinating. One of the things that I love about Dayle and her work is that she shares her creative journey fearlessly (which to me means that she faces fear in the face until it backs down and salutes her …. a paraphrase of a quote that she uses in class). Her belief in the journey gives me permission to face my own fears and then enlist them as collaborators in the process. So happy to see Dayle’s new work here. She is aways inspiring, as is her work and journey! These flowers are so lovely! Especially on such a wintery stormy day here in the northwest. Thanks for the encouragement to go a different path every now and then! Yes, I too am charmed by Dayle and her vision. These are gorgeous, Dayle! And a necessary reminder that we need to take time away from our obligations to “create for ourselves” and discover new designs. I can’t wait for the Dayle’s new book to be published! She is always inspiring!